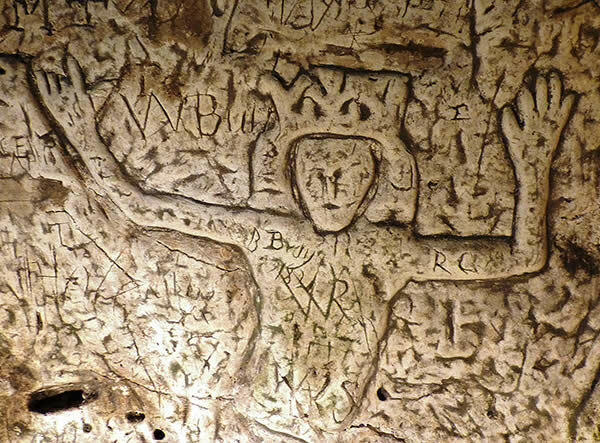 Some forty miles north of London is a cave, whose peculiar shape and curious wall etchings are so emotionally charged and symbolically rich that experts remain baffled as to its origins and purpose. 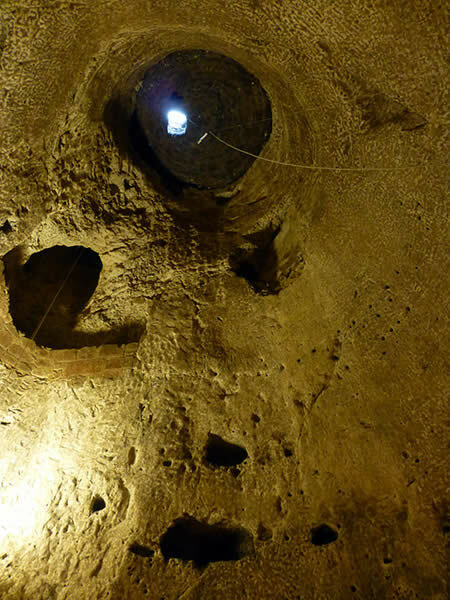 I speak of Royston Cave, a fascinating subterranean dwelling beneath the streets of Royston, an unassuming village in the historical county of Hertfordshire, England. 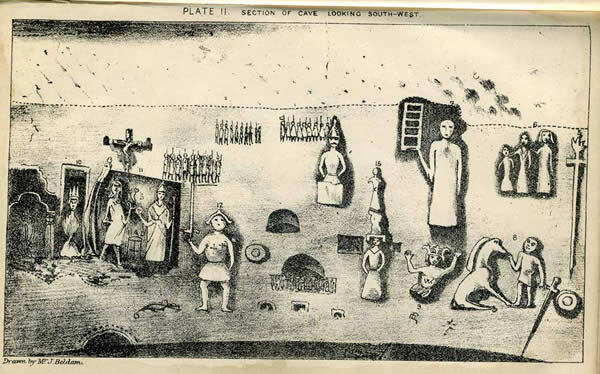 Antiquarians have studied Royston Cave’s idiosyncratic drawings for centuries, and their artistic renderings have provided us with a time capsule of what the cave looked like before weathering, vandalism and the Victorians took their toll. 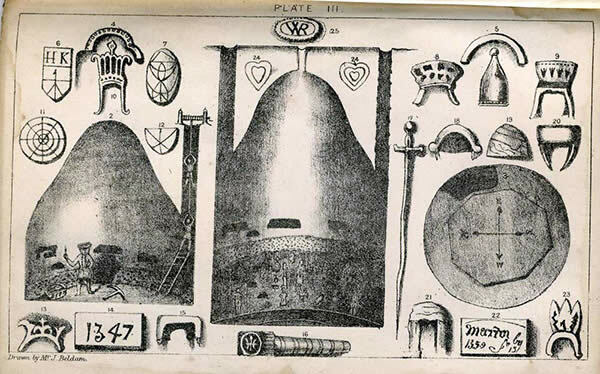 Nevertheless, sketches such as those by William Stukeley (1742) and Joseph Beldam (1884) do not prepare you for just how small, and how peculiar, the cave really is. 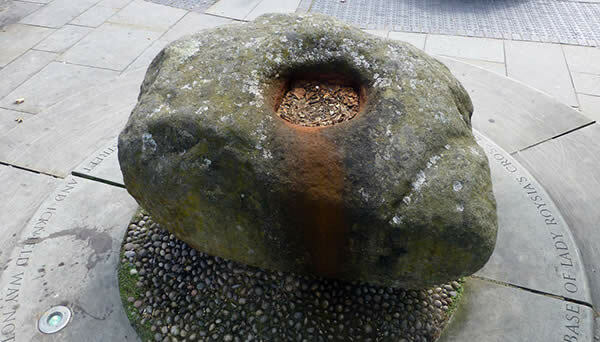 The bell-/beehive-shaped cave is eight metres (26 feet) high and five metres (17 feet) in diameter, and is entered through a door in an alley just off the High Street. After a short descent one is immediately transfixed by what appears at first to be a random collection of Pagan, religious and medieval-themed imagery, unique in Great Britain, if not the world. Pictures of the Holy Family, John the Baptist, St Lawrence, St Christopher, St Thomas à Becket and even a Pagan sheela na gig decorate its walls, and as I stood and admired the carving I could not help but feel that I was standing centre stage in a theatre and that the images were my audience. No-one is certain as to when the cave was constructed, or by whom, although the Knights Templar remain the choice du jour of most enthusiasts. 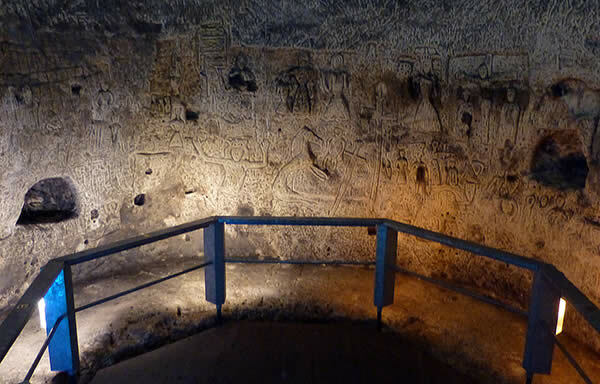 This supposition is not without merit, however, for there is evidence of Knights Templar strongholds nearby and there are many Knights Templar-inspired images on the cave walls. Still, sceptics of the connection are quick to point out that the figures in armour date to at least one hundred years after the Knights Templar. The mystery of what is represented inside the cave is equalled by the mystery of what was once situated above it. Royston Cave sits below the crossing of two ancient roads: Ermine Street, the Old North Road, which ran from London to Lincoln and on to York; and the Icknield Way, a prehistoric trackway following the chalk escarpment, believed to be the oldest road in Great Britain. Here, it is said, a cross once stood, in the middle of what was then a bustling market town. Supporting the legend, the remains of a cross were unearthed during modern-day roadwork excavations and its base remains a fixture in the town square today. The antiquarian, William Stukeley, called it ‘a flattish stone, of very great bulk, with a square hole, or mortaise, in the centre, wherein was let the foot of the upright stone, or tenon, which was properly the cross.’ Indeed, we know of its shape, but what do we know of its origins? …a famous Lady Rosia, by some supposed to have been the Countess of Norfolk, about the time of the Norman Conquest, which Cross, was called after near name Royse’s Cross, till Eustace de Marc founded, just by it, a Priory, dedicated to St Thomas à Becket, the Martyr of Canterbury; upon which occasion inns came to be built, and by degrees it became a town which instead of Royse’s Cross, took the name of Royse’s Town, afterwards contracted to Royston. Lady Rosia was the wife of Geoffrey de Mandeville, the first Earl of Essex, and the erection of her cross, the Royse Cross, is reminiscent of the Rosy Cross (also called Rose Cross and Rose Croix), a name that is synonymous with the alchemist, Christian Rosenkreuz, the historically ambiguous founder of the Rosicrucian Order, which dates to around this time (thirteenth to fourteenth centuries). This is curious, indeed, for not much is known of Rosenkreuz or the Rose Cross, other than it is said to be a cross with a white rose at its centre. We are told that Rosenkreuz discovered the knowledge that led to the founding of the order on a pilgrimage to the Middle East in the fifteenth century, although details are sketchy, if not dubious. 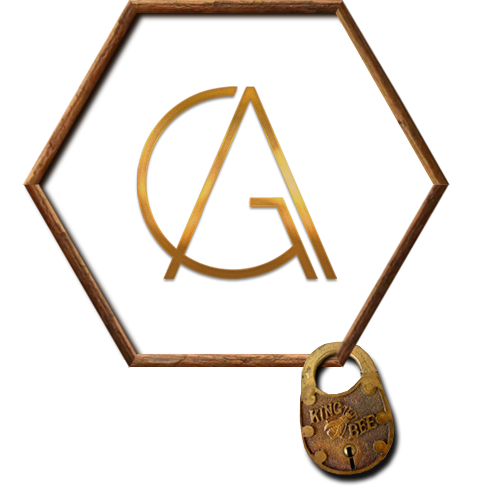 Intriguingly, it is believed that Rosenkreuz’s body was buried in the interior of the earth, in a chamber that represented a storehouse of knowledge, and Royston Cave is shaped like a beehive – a symbol that represents the wisdom of the ages. The legend recalls the expression VITRIOL: Visita Interiora Terrae Rectificando Invenies Occultum Lapidem, meaning ‘Visit the Interior Parts of the Earth’; by Rectification Thou Shalt Find the Hidden Stone. Still others believe that the Rosy Cross originates from the Red Cross of the Knights Templar, and that the original ‘Rose Croix Masons’ were, in fact, the descendants of the Knights Templar. Nevertheless, the possibility that Rosenkreuz and the Rose Cross could have originated in England is intriguing. 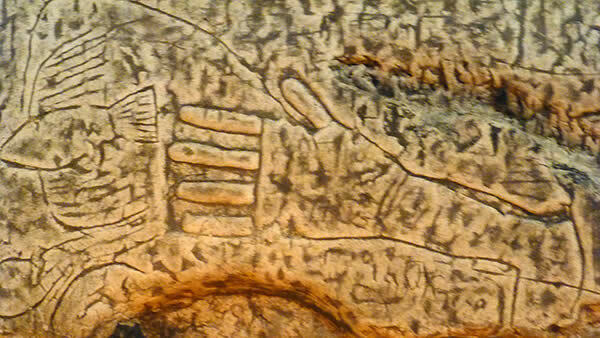 Stukeley was correct – Royston Cave was discovered entirely by accident. 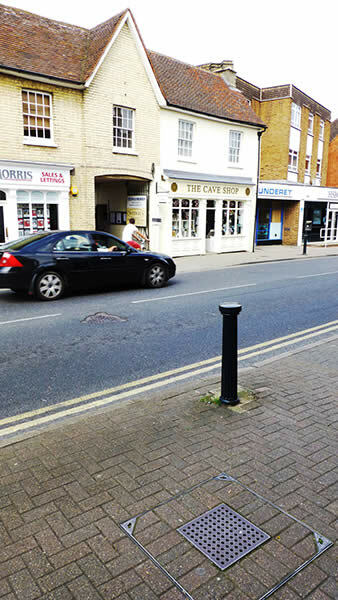 In August 1742 a workman, who was erecting a bench for local retailer, penetrated the top of the hive when digging a hole for a post and a mere two years later the cave was opened to the public. 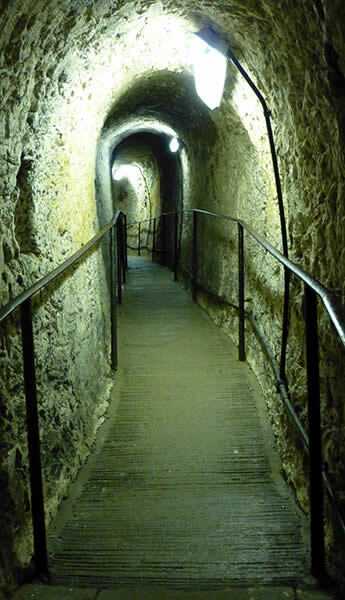 Today the cave is run by English Heritage and is open to the public for most of the year. Royston was also home to a priory, a monastery and two hospitals. Its history is absorbing, but does it provide any real insight into what the cave may have been used for? There are many theories, some more believable than others. They include; a flint mine; a denehole for extracting chalk; a Mithras temple; a Roman sepulchre; a hermitage; an ice pit; and market storage, to name a few. Again, despite its flaws, most serious researchers lean towards the theory that Royston Cave was a Knights Templar chapel, perhaps even a replica of the Holy Sepulchre Church in Jerusalem, complete with an altar in the west and an assortment of cult figures decorated by none other than the Knights Templar. Supporters of the theory cite the fact that the Knights Templar were in Royston most weeks, from at least 1199 onwards, and maintained churches in neighbouring villages. Adding credence to this theory is the fact that the Knights Templar were in conflict with the Priory of Royston, clergy who were known to have imprisoned Knights Templars from nearby Baldock. The Knights Templar would have needed a safe and private place to worship on market days and the cave beneath the market cross would, in many ways, have been the perfect safe haven. 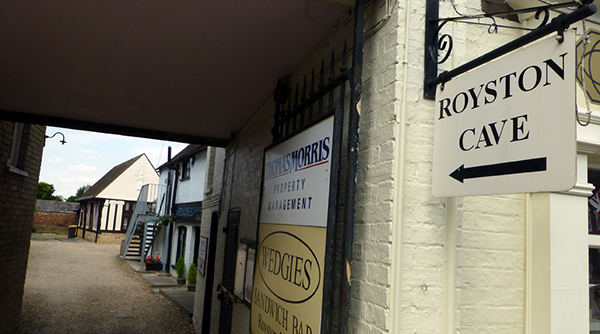 There is also a strong belief amongst local historians that there are, in fact, further underground caves in the immediate vicinity of Royston Cave and that they may once have been connected or served a similar purpose. Just what this possibility means to the Knights Templar origins of the cave is uncertain. Nobody knows for sure what Royston Cave is all about; that is certainly part of its charm and considerable appeal. All we know for certain is that it is an amazing place. I can attest to that. It is a hidden gem, and is likely to remain so for a very long time. 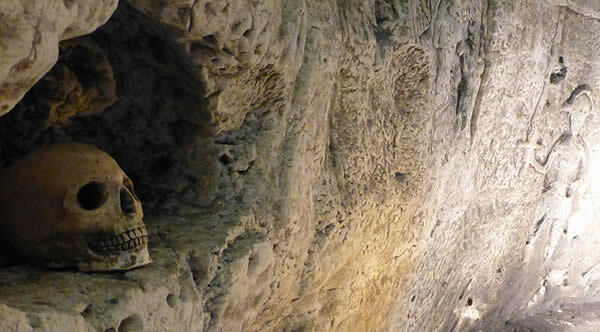 Suggested reading includes Royston Cave: Used by Saints of Sinners? by Silvia P. Beamon M.A.